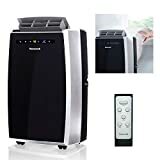 Portable air conditioners are the incredible invention that one can take to any room or place and enjoy the cool temperatures. Indeed, summer nights might make an individual feel uncomfortable because of the hot temperature. 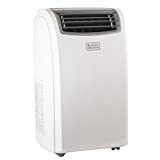 However, one can get rid of it by buying a portable air conditioner. Portable ACs can be placed in a home, shops, or office since they don’t require permanent installation. They also use less power. Besides, they perform great and are available at affordable prices. These products are unique from traditional window air conditions. The products are easy to use and mobile. Admittedly, there are various models and brands of portable air conditioners on the market. Therefore, selecting the best portable AC is a daunting task for many individuals. 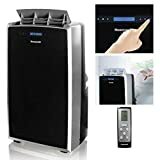 This article has the 10 Best Portable Air Conditioners Reviews. Choose one and be sure to live a comfortable life. Here are the Best Portable Air Conditioners Reviews. This Honeywell MN12CES 12,000 BTU has a cooling power of 12,000. The unit can efficiently cool areas between 400 to 450 sq.ft. The unit has an option for continuous drainage. Therefore, it drains the excess moisture that builds up inside the unit periodically. So, the users have no worries regarding the moisture buildup. It also features a programmable timer—it sets the portable AC to turn on/off in advance (up to 24 hours). Also, it has an adjustable airflow that directs the cool air to all parts of the room. The unit has multiple fan speeds; it provides three (3) fan speeds that make it easier for an individual to control how fast the cool air distributed across the room. Air filter—it has an air filter (washable) that catches all unwanted particles in the cool air before disbursing it across a room. Bucket-full indicator—the removed moisture from the air inside the room builds up in a pan. This indicator notifies the user when the internal pan is full and should be emptied. The Honeywell MN10CESWW 10,000 BTU Portable AC has a cooling power of 10,000. It can efficiently cool areas between 350 to 400 sq.ft. This portable air conditioner is fantastic. It features 3-in-1 functions; cooling, dehumidification, and fan. It has a built-in dehumidifier which removes up to 64 points every 24 hours. Other features of this unit include feather-touch LED controls, eco-friendly refrigerator, a programmable timer which is a 24-hour energy saver, and a powerful airflow 174CFM. In addition, it has wheels that make it easy to move the unit from one room to another. The items included in its box are installation accessories, remote control, and an instructional manual. This is an eco-friendly portable AC. The unit is an effective air conditioner. It can draw warm air in a room and convert it into the fresh, cool air. It can cool areas up to 500 sq.ft. The cooling capacity of this unit is 14,000 BTU. It has casters that make it easily portable. The unit also features three (3) fan speeds. In addition, it has a digital display—allows accurate temperature control, programmable timer, remote controls for easy adjustment of the temperature & function mode, and an activated carbon air filter; for removal of smoke and odour. ARC-10WB is environmentally friendly. The cooling capacity of this unit is 10,000 BTU. It can be moved easily from one room to another since it has caster. Its digital display enables the user to control temperature precisely. The unit also features a programmable timer, and four (4) speed fan that has directional air disburse lovers. In addition, it can restart itself automatically in case of power outage. 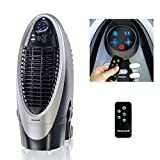 Other features include a remote control that enables the user to adjust temperature & function mode easily, a self-evaporative system, and washable pre-filter among others. Admittedly, this unit incredible. This unit can cool areas up to 550 sq.ft. AC features 3M electrostatic filter, a compressor, and 3-in-1 technology. Portable AC has 3-in-1 functions—dehumidification, cooling, and fan. This AC features a built-in dehumidifier that removes up to 90 pints per day. Besides, the unit has feather-touch LED controls, the newest no-drip technology that uses an automated-evaporation system, and eco-friendly R410A refrigerant. 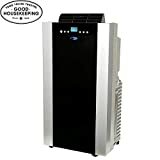 This unit will solve any cooling problems, particularly when it is not practical, affordable, or efficient to install or even expand CRAC (computer room air conditioning) or HVAC capacity. Its cooling power is 12,000 BTU. It uses eco-friendly R410A refrigerant. It doesn’t require a water collection tank since it has a built-in evaporator. Also, the unit has an automatic restart feature. The unit is good for small to medium businesses, and schools where budgets are very tight. This unit is among the best. It features Automated water evaporation. 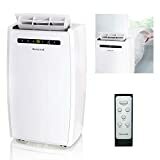 And 4-in-1 function; dehumidifier, fan, heater, and air conditioner. Also, the unit has 24-hour timer & sleep mode, eco-friendly R410a refrigerant, and washable filter. The caster wheels enhance its mobility. The unit also features a control panel that has LED Display and everything needed for easy installation. This portable AC is the best. It features honeycomb cooling media which is meant for faster and efficient cooling performance. Also, it has a non-compressor system that cools efficiently, inexpensively, and naturally. The unit also has carbon dust filter which eliminates unwanted particles in the air, and powerful & steady air flow—300 CFM. Other amazing features are easy mobility because of the built-in wheels, remote control, and low consumption of power among others. Its cooling power is 14,000 BTU. Dehumidification per hour is up to 3.4 pints. It has LCD display—with digital touch controls. It also features three cooling speeds, three fan speeds, and also energy saver mode. Other features include an automatic restart feature and eco-friendly R410a refrigerant among other features. This unit can cool up to areas of 700 sq.ft. This unit has a cooling power of 14,000 BTU. Besides, it has a heating capacity of 12,000 BTU. The unit features 4-in-1 functions—heating, cooling, dehumidification, and fan. 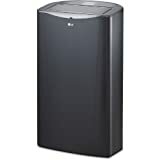 It features a built-in dehumidifier that removes up to 95 pints per day. Other features of this unit include a programmable timer, modern no-drip technology that use automated evaporation system, feather-touch LED controls, and powerful airflow. Also, interchangeable brackets. Remote control, installation accessories, and instructional manual are included in the box.